1.2 From time to time on www.euroffice.co.uk (the “Website”) we run promotions. 3.12 Web-coupons distributed or circulated without the written approval of Euroffice, for example on an Internet message board or on a "bargains" website, are not valid for use and may be refused or cancelled. 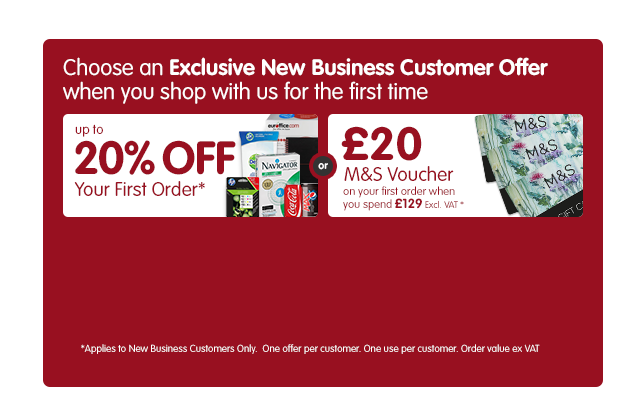 3.17 Only one High Street Voucher may be redeemed per customer for the duration of the promotion. This promotion does not apply to multiple orders. 5.3 Employees of Euroffice Limited, its subsidiaries or affiliated entities and their immediate family members are not eligible to enter prize competitions. 5.12 By registration on entry to the competition, Participants indicate that they have accepted the these Terms and Conditions. If you're a Euroffice customer, you're automatically part of our free Rewards Programme. You can start collecting points today when you shop online and then spend the points on treats for your home or office. 6.1 We may, at our discretion award you reward points for the reasons and in the amounts set out below. Please note that the benefits of our Rewards Scheme are intended for the use of the individual listed on the account and in order for reward points to be applied to your account, you must be logged in. When you register as a customer - 250 points. When you save a printer (Applies to the first 5 printers per customer) - 100 points. Every time you shop online - 1 point for £1 you spend (ex VAT and delivery charges). When you submit a published product review - 25 points. When you submit feedback online or via our email communications - Various points given. 6.2 From time to time we run promotions where you can qualify for additional reward points subject to minimum spend requirements or the purchase of specific products. 6.3 You may also qualify for additional reward points by entering and winning our competitions, completing surveys or participating in other research programmes. The number of additional reward points that you may be entitled to will be advertised on the Website and/or via email. 6.4 Your points will accumulate automatically when you earn reward points. 6.5 Points can be collected at any time through orders or special promotions. However if you’ve collected 200 points or more in a calendar month then no further points will be added to your account for product reviews, blog comments or for saving printers until the next calendar month. 6.6 The reward points you accumulate may be redeemed for rewards which are displayed on our Website. The rewards do change and we cannot guarantee that a reward available one day will still be available on the following day. 6.7 All rewards are subject to change and availability. 6.8 Delivery or postal charges may be payable by you in respect of rewards and this will be made clear in the section of the Website where you choose your rewards. 6.9 Redeemed points cannot be used again and will be deducted from your points total. 6.10 You are required to make a minimum number and value of purchases within a given period to maintain your accumulated points total. If there is no eligible activity on your account (as defined below) the accumulated points will be expired and the rewards balance returned to zero. 6.11 Once points have been expired they cannot be retrieved but you may begin to earn points again thereafter. Any rewards redeemed by you before the points are expired (such as a reward gift you have ordered and awaiting delivery) are still valid. 6.12 You are able to check your reward points total and their expiration date on the Website by logging into the “My Account” section of our site. 6.13 You are responsible for remaining knowledgeable as to the Scheme’s Terms and Conditions and as to the number of points in your account. Euroffice will endeavour, but is not required, to notify customers at risk of forfeiting their reward points. Any correspondence we send in relation to our rewards scheme will be by email and to the email address you have registered with us. 6.14 Customers with overdue, unpaid invoices on their account are subject to forfeiture of points equal to the amount of points accumulated in connection with those overdue amounts. We also have the right to remove you from the scheme should the outstanding debt continue. We will give you notice by email before you are removed from the scheme to ensure you have appropriate opportunity to pay the outstanding debt or call us to set up a payment arrangement. If you believe the outstanding debt to be incorrect or you want to dispute the debt, please contact us to discuss. 6.15 If at any time, in our reasonable opinion, you are deemed to be abusing our rewards scheme we reserve the right to withdraw you from the scheme and cancel any accumulated points on your account. 6.16 Points or rewards received through participation may be subject to tax liability. All tax liability, including and without limitation disclosure connected with the receipt and/or use of points or rewards, is the responsibility of the individual listed on the account. 6.17 We may make changes to our rewards scheme and these Terms and Conditions and we will give you as much notice as possible of those changes. We may suspend or terminate our rewards scheme at any time but we will give you as much notice as possible before we do so. If this happens your reward points total will be frozen or lost. 7.1 This promotion is carried out by Euroffice Ltd., whose registered office is at Dome House, 48 Artillery Lane, London E1 7LS. 7.2 This offer is only available to residents of Great Britain and Northern Ireland. Only end user customers based in the UK and Northern Ireland are eligible to claim Cash back in this promotion. 7.3 Ink Cartridge & Toner products returned for credit within the 14 day returns period may reduce your category spend below the required minimum spend. 7.4 Upon purchase of the product, the amount of money due to the participant in the promotion will be issued within 21 working days. 7.5 Payment can only be made to the person identified in the customer account section as being the billing contact. 7.6 A maximum total of 1 cash back offer can be claimed per customer. The cash back amount is VAT inclusive. 7.7 To the fullest extent permitted by law, Euroffice Ltd shall have no liability whatsoever to any participant in this promotion in respect of this promotion. 7.8 Euroffice Ltd reserves the right to withdraw this offer or alter these terms and conditions or the amount of cash back available at any time without providing notice. 7.9 In the event of the offer promotion withdrawn payments will only be honoured for applicable purchases completed prior to removal of the offer. 7.10 This promotion cannot be used in conjunction with other promotions.